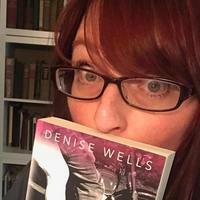 Denise Wells has read 32 of 125 books. Denise Wells read 144 books of her goal of 125! I can't live without nail polish, the darker the better. I drink a glass of wine every day, but if I could get away with it, I’d drink a bottle. My favorite things to eat are chips with salsa. But red vines with popcorn are a close runner-up. I currently reside with six dogs, one cat, and a husband. Five of my dogs are Siberian Huskies, so my clothes always have fur on them. Always. Hoodies are my favorite item of clothing, bras are my least. I started an underground literary magazine in graduate school, which I credit for really launching my narcissistic tendencies via I can't live without nail polish, the darker the better. I started an underground literary magazine in graduate school, which I credit for really launching my narcissistic tendencies via writing. To ask Denise Wells questions, please sign up. Denise Wells Living vicariously through characters. We’d love your help. Let us know what’s wrong with this preview of Claiming Bailey by Susan Stoker. We’d love your help. Let us know what’s wrong with this preview of Claiming Alexis by Susan Stoker. We’d love your help. Let us know what’s wrong with this preview of Claiming Grace by Susan Stoker. We’d love your help. Let us know what’s wrong with this preview of Defending Morgan by Susan Stoker. We’d love your help. Let us know what’s wrong with this preview of Defending Chloe by Susan Stoker. We’d love your help. Let us know what’s wrong with this preview of Defending Allye by Susan Stoker. We’d love your help. Let us know what’s wrong with this preview of Marx Girl by T.L. Swan. We’d love your help. Let us know what’s wrong with this preview of Pricked by Winter Renshaw. We’d love your help. Let us know what’s wrong with this preview of Mr. Masters by T.L. Swan. We’d love your help. Let us know what’s wrong with this preview of Mr Spencer by T.L. Swan. “Yeah.” He moved his fingers between hers, and that, too, he felt everywhere – all over the surface of his skin.